Here Are GQ’s Best New Restaurants for 2019Henry at Life Hotel and Shabu Shabu Macoron made the cut. Here Are GQ’s Best New Restaurants of 2018New York is represented by Chez Ma Tante and Cote. Everyone’s Freaking Out Over This Extremely Hot British GQ CoverNaomi Campbell and Skepta strip down for the April issue. NBC Is Making a Sitcom Based on Chili’s Elite Corps of ‘Super-Trainers’It’s about a gung-ho team that “travels the country opening new branches” of a casual-dining chain. Brad Pitt Speaks Out for the First Time About Divorce and Drinking Too MuchOh, and his newfound appreciation for R&B. GQ’s ‘10 Best New Restaurants of 2017’ Includes Aska, Han Oak, and Side ChickPlus a Japanese-Texan izakaya and Michael Solomonov’s Jewish luncheonette. This Season’s Hottest Cover Trend: Men Wearing Women As BackpacksTime to ditch your Fjallravens. GQ Wonders If Men Look Ridiculous NowMakes you think. Amber Rose Is Ready to Motivate YouListen up, team. Men Are Proudly Owning Their ‘Groomzilla’ LabelThey’re here — get used to it. Taylor Swift Unwinds With Friends — the ShowHer true squad is Ross, Monica, Rachel, Phoebe, and Joey. Amy Schumer and Hillary Clinton Bonded Over Dumb MenThis should be their campaign platform. John Mayer Defends His Layering FixationThe man simply cannot get his hands on enough Tibetan robes, okay? Highlights From GQ’s Kendall Jenner ProfileWhat do we learn about “Keezus”? Kim Gordon Wants to Be Like Joan Didion, TooKim Gordon is us. Kit Harington Suffers From Bitchy Resting FaceWhat’s wrong, Kit? GQ Tries to Demystify Tilda Swinton for the Average ManAn impossible feat. Adam Driver Wears a Questionable Vest on GQHe’s on the September cover. Kanye Gets Very Emotional About LayeringThe power of a great wrap. Adam Levine Not a Douchebag, Thinks Adam LevineA defense, by Adam Levine. Ryan McGinley Doesn’t Think New York Is Boring NowBut he thinks you are boring for saying so. Kit Harington Seems Kind of Bitter About HairThe Game of Thrones star is contractually hairy. Anthony Weiner, ‘Empty, Soulless Vessel’A broken man reflects. Male Gaze: The Face of a ‘Man Who Cares’Call him Nord, James Nord. GQ Rounds Up 50 Stand-Out Foods and DrinksIt includes Federal Donuts, Ox’s clam chowder, and Café Gratitude’s hummus. Tien Ho, Alex Stupak, and More Are Your Latest Hot Stuff Chef-ModelsForget Restaurant Week, it’s Fashion Week for chefs. Elisabeth Moss Only Wears Office-Themed LingeriePeggy Olson office cardigan at all times. Buzz Bissinger Reportedly in Rehab for Gucci AddictionAfter professing his shopaholism in GQ. GQ’s Tips for Interior Design: Add a Naked LadyImprisoned for all eternity, like the woman in the moon. GQ Names the ‘12 Most Outstanding Restaurants of 2013,’Richman doesn’t care if waiters wear dirty T-shirts. GQ Put Beyoncé in a Belly ChainWe’re not mad about it. Glenn O’Brien on Brad Pitt and Women’s FashionThe longtime GQ style columnist calls for the return of brooches. Kate Upton Cleavage-Free on British Vogue Cover“She’s hardly a heffalump,” says editor Alexandra Shulman. GQ Let Rihanna Keep Her NippleDefying celebrity photo shoot norms. Alan Richman (Finally) Discovers PortlandIt’s taken longer than pretty much anyone else. 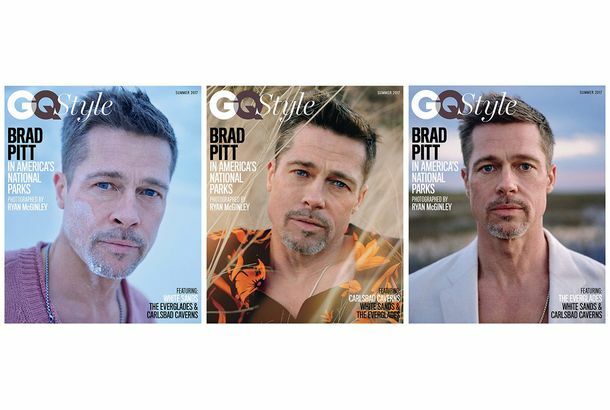 Condé Nast Budget Cuts Mean Layoffs at GQ, SelfGlamour and Fairchild are also reportedly at risk. Debunking the Nice-Nerd MythGuys who were nerds in high school are not nicer, says GQ, especially now that they’ve inherited the earth. Nearly 80 Percent of New York Models Were WhitePlus, the Daily interviewed a cigarette. British GQ Crowns Lana Del Rey ‘Woman of the Year’Not included with the award: an actual crown. Are You an ‘Elite Girl’ or Are You ‘Filler’? “We don’t care, just bring us some sluts!” say Marquee Las Vegas clubgoers.